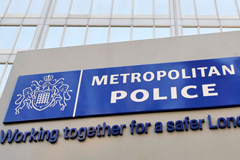 A 16-year-old boy has been arrested over the murder of a teenager in south London, the Metropolitan Police said. Police were called to Tilford House, Holmewood Gardens, Brixton, at 17:00 BST on Sunday following reports of a stabbing. A 17-year-old boy was taken by London Ambulance Service to a south London hospital, where he was pronounced dead. The 16-year-old, arrested on suspicion of murder, has been taken to a south London police station for questioning.